Torrential rains triggered flash floods and landslides on the Indonesian island of Sumatra, killing at least 22 people, mostly children at a school, and leaving 15 others missing, officials said Saturday. The National Disaster Mitigation Agency's spokesman, Sutopo Purwo Nugroho, said rescuers were searching for 10 other children still missing. 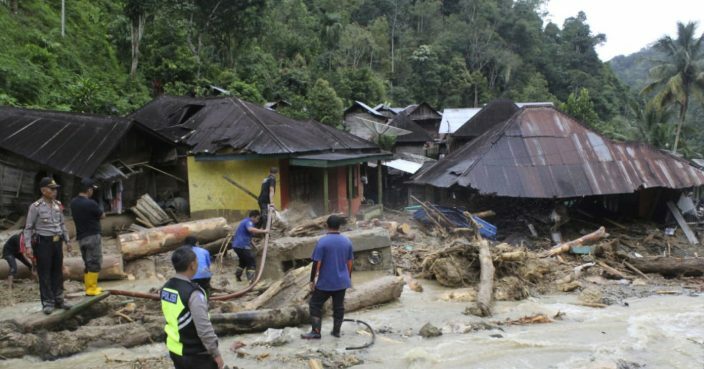 Nugroho said two bodies were found early Saturday from a car washed away by floods in Mandailing Natal, where 17 houses collapsed and five were swept away. Hundreds of other homes were flooded up to 2 meters (7 feet) high, while landslides occurred in eight areas of the region. He said flash floods also smashed several villages in West Sumatra province's Tanah Datar district, killing four people, including two children, and leaving three missing. Landslides and flooding in West Pasaman district killed a villager and left two missing after 500 houses flooded and three bridges collapsed.